If you haven’t checked out Portuguese wines recently, it’s time to take a look. I love Portuguese wines. There are some amazing values to be found, and I like a value. 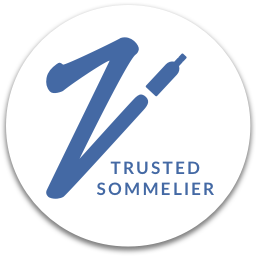 I think a lot of people shy away from these wines because they’re are a lot of indigenous varieties–around 248–most of which are not grown anywhere else, so there are a lot names people don’t recognize. Beyond that, I think a lot of people still associate Portugal with only dessert wines and maybe Vinho Verde. Don’t get me wrong–I love Madeira and Port–but Portugal is making some absolutely wonderful red wines. Moreover, I think they hit a really great spot between New World and Old World styles. They tend to have a delicious ripe quality to the fruit that is really approachable, combined with a little of the earthy factor of the Old World, along with some attractive spice notes. In short, they can satisfy a wide range of palates. To be fair, quality was iffy for a very long time, but around the 1990’s they began working hard to turn that ship around. Bonus, since a lot of people haven’t discovered these wines yet, they often over-deliver at whatever price point you’re looking at. 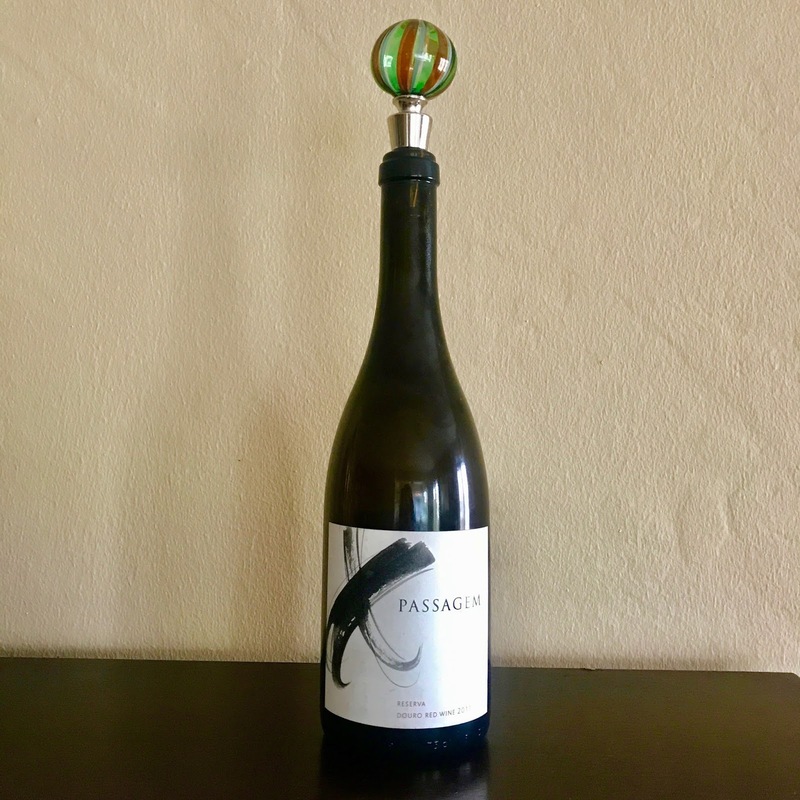 Today’s wine–Quinta das Bandeiras Douro Passagem Reserva 2011–comes from the Douro Valley. This is the same region that makes Port, but they do also make dry table wines. The region follows the Douro River and if you keep on following it east, it becomes the Duero in Spain. The Douro has a really long history of winemaking–it’s actually one of the world’s oldest delimited wine regions. The river winds it’s way through a really craggy mountainous region with vineyards that are carved along the mountainsides–often in terraces known as patamares. 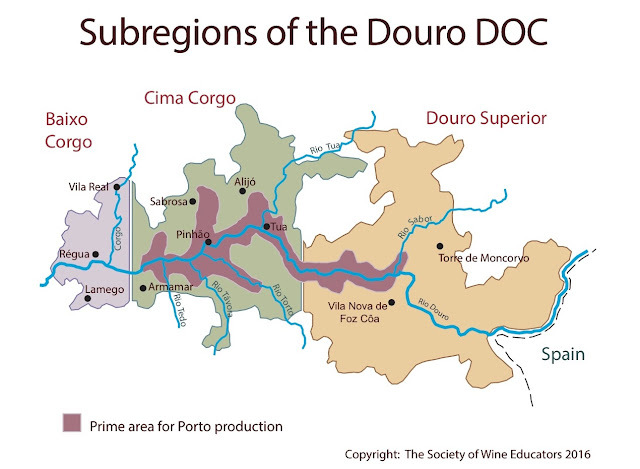 The area is divided into 3 sub sections–Baixo Cogo, Cima Corgo, and Douro Superior, from west to east, going right up the Spanish border. Today’s wine comes from Douro Superior. It is the furthest inland with the most continental climate–crazy hot in the summer, and really cold in the winter. While it’s the largest subsection, it is also the least developed–partly due to the fact that it is also the furthest away from the port lodges in Vila Nova de Gaia, across the river from Oporto, where the wines were traditionally made. Seeing as how this is the area with the most untapped potential, it has been seeing a lot of development in recent years. The land here is also flatter than in the other two sub regions, meaning that it can also be a little easier to work. Rabelo boats in Porto at night–these were traditionally used to move the wine for Port from the vineyards in the Duoro Valley to the cellers in Oporto and Gaia, but now are more of a tourist attraction. Shot by Greg. The Passagem wines are a joint winemaking project between the Bergqvist family (of Quinta de la Rosa) who bought the property in 2005 and Jorge Moreira (of Poeira). ‘Passagem’ means journey or crossing. It is named for an abandoned railroad and crossing on the property, but it is also indicative of the journey of making wines in a developing region. I’d been holding onto this wine for a couple of years (from the cellar, so no purchase info on this one) and on the day we opened it, Greg and I picked up layers of red and dark fruits–bright black cherry sauce and blackberries on top of deeper plum notes, both fresh and a little pruned. It is a few years old after all. There were light violet notes and bramble, as well as some tobacco and black tea, with well-integrated spice and smoky notes with a light hint of exotic star anise. It was juicy, but the center was a core of granitic stones. The acidity was still quite bright, so while the wine was juicy and lush with a medium+ body, it was still really lively. The tannins were well integrated, but they showed their grip just at the finish. We considered several options of what to pair with this. The liveliness of the wine, along with the spices, and very integrated tannins gave us options. We didn’t feel like we needed to stick with big meats for this. We considered game meats like venison, and Greg brought up duck mole. I think that would have been delicious, but I just didn’t have the time for mole on this particular day. My thoughts turned to memories of trip our to Portugal a few years ago. We were having a terrible day for reasons I won’t go into now. It’s enough to say that Greg, my best bud Anto (with whom we were traveling), and I were cold, wet, cranky, and hangry when we stopped into a little mom-and-pop restaurant in Belém, outside Lisbon. I ordered an octopus stew that was so comforting and delicious. Our whole day changed from that point on. (It got even better when we got the Pastéis de Belém down the street, but I digress.) I thought an octopus dish could handle this wine, Greg thought wine would add depth to the braising liquid, and that became the inspiration. The restaurant that saved the day. Pastéis de Belém, just because they're delicious. 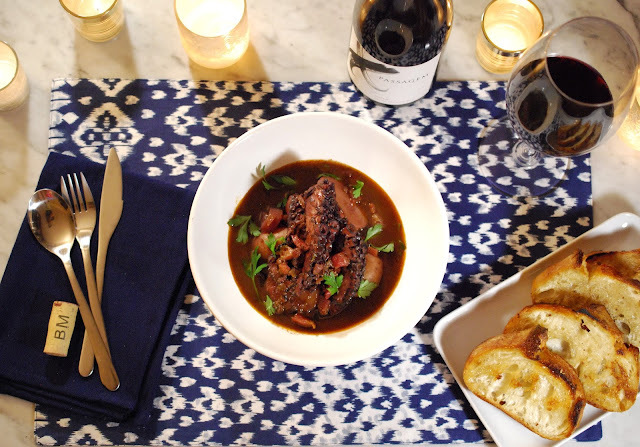 In creating this dish, I took inspiration and adapted portions of this recipe for Red Wine-Braised Baby Octopus with Black Olives from Food & Wine and Gabrielle Hamilton’s recipe for Alda’s Braised Octopus with Potatoes in her Prune cookbook. I also looked at George Mendes’ My Portugal for spice guidance. 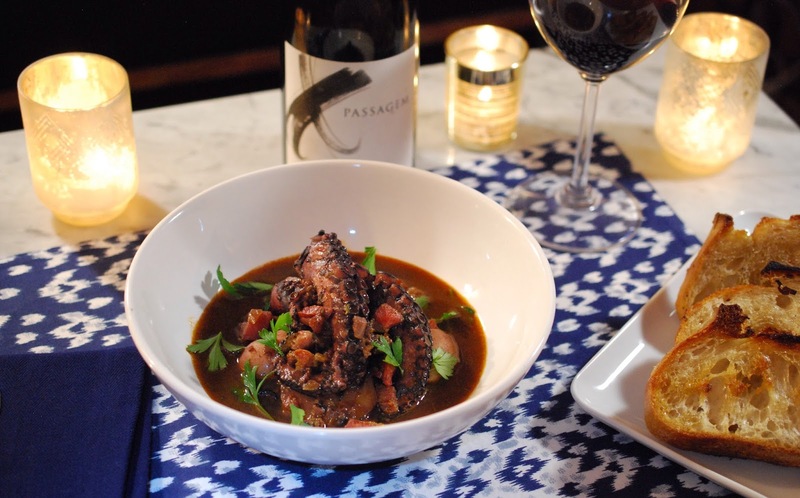 If you're intimidated by the idea of cleaning and preparing octopus, rest assured that it's a whole lot easier than it looks. Check this really quick tutorial on YouTube for a demo. We were both left swooning at this dish. This is saying a lot because I somehow landed on a braised dish on what ended up being a day of record-breaking. We waited until well after sundown to eat, but it was absolutely worth it. I definitely recommend decanting this wine. While the bottle was open all day, I didn’t decant it and so had that bittersweet experience that the last half glass was the most spectacular. It was good throughout, but it just all came together beautifully and was singing at the end. At this point, it was jiving and melding with the food at its best as well. (Prior to that, the two were working well together, but weren’t fully in sync yet. Now they danced.) The spices in the stew flowed perfectly with the spice and herb notes in the wine. The weight of the wine matched well with that of the food, and brightness in the wine gave the deep flavors of the stew a refreshing lift. The swooning has continued over the memory. 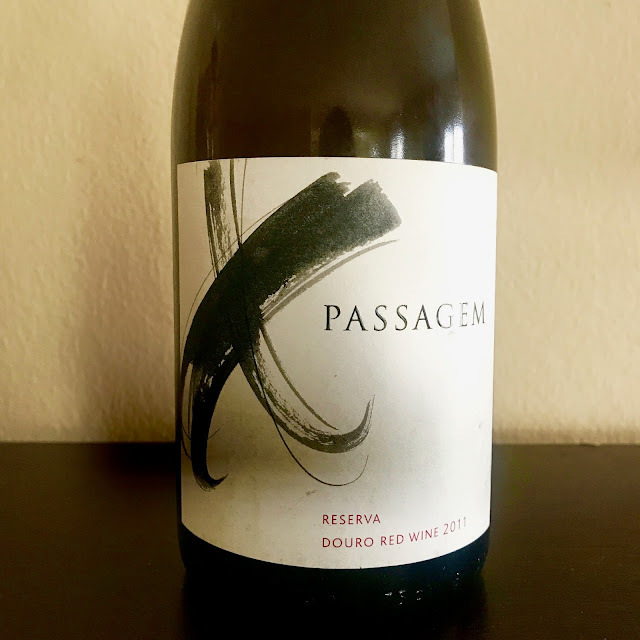 I wasn’t able to find the blend on the 2011, but other vintages list a blend of the Douro varietals, usually dominated by Touriga Nacional and Touriga Franca. The wines are usually matured in French oak casks for 18 months before bottling. WineSpectator.com lists the original retail price on this at $25, Wine Enthusiast lists it at $30, so it’s not super cheap, but I think it really delivers on both complexity and pleasure. I think this is an Attainable Indulgence and an Overachiever. We had a lot of leftovers from this dish, so we had the chance to try a couple of Côtes du Rhônes with the stew on subsequent evenings and those also worked well. I’d say the guidelines here would be to look for red wines of medium to medium+ body with ripe fruit notes. It can handle some spice, but you’ll want to keep the tannins moderate. Serves 6 to 8. Total cooking time was about 90 minutes, plus prep time. However, only about half the cooking time was active. 1. Heat a little oil in a large Dutch oven or pot over medium-high heat. Add the pancetta or bacon to the pan and cook until lightly crispy (2 to 3 minutes). Remove the pancetta from the pan and set aside. 2. Lower the heat to medium, then add the red onions, celery, garlic, crushed red pepper, thyme, bay leaves to the pot, stirring often. Once the onions have begun to soften, 5-6 minutes, add the sliced carrots and continue to cook for another 5 to 6 minutes, or until the onions are fully soft. 3. Add the umami paste, diced tomatoes, coriander, paprika, star anise pod, tomatoes, and a pinch of salt. Add in the tomatoes and stir together to combine. Taste and adjust seasoning. Add in the potatoes followed by the octopus. 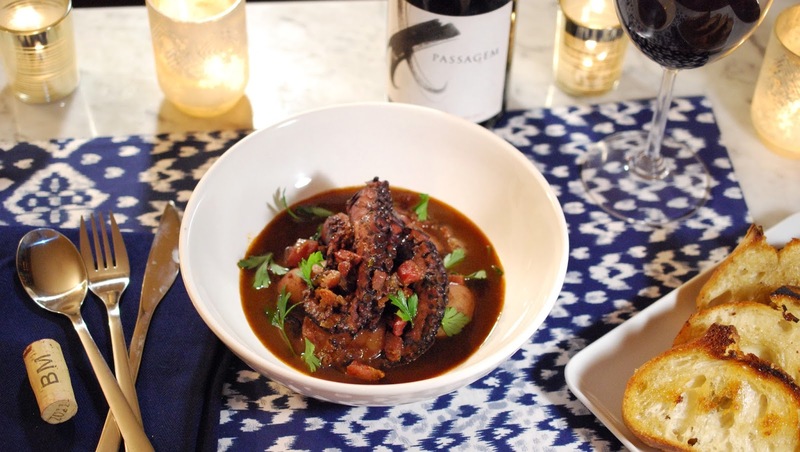 Add the red wine–it should almost cover the octopus. Cover the pot and bring to a boil, then turn the heat down to a really gentle simmer. Let it cook undisturbed for about 45 min. 4. Check in on the masterpiece in the pot and make sure that the octopus and potatoes are both tender and fully cooked through. Continue cooking if needed. Once tender, add in the olives. (Gradually add in the olive brine as well if desired, tasting as you go.) Taste and adjust seasonings to make sure it’s all delicious and to your liking. Add in ½ the pancetta. 5. Once ready to serve, remove from heat and remove the bay leaves, thyme, and anise pod. Serve in bowls and garnish with parsley leaves and additional pancetta. To take this over the top serve with thick crusty bread. Bonus move–grill the bread in pancetta/bacon fat or garlicky olive oil to make it extra special. Alternatively, serve with rice or noodles. Tip: If you have leftovers, separate the octopus pieces before reheating the rest of the stew. Bring the rest of the stew to boil, reduce heat, then add the octopus back in and reheat gently to maintain the tender texture. If you have more stew leftover after the octopus is gone, you can poach other seafood (shrimp are tasty here) in the liquid. Tomorrow morning I'll be discussing Portuguese wine pairings with the Wine Pairing Weekend #Winophiles on Twitter. Feel free to join us simply be checking the hashtag #WinePW 11am EST/8am PST. From Camilla Mann of Culinary Adventures with Camilla: "Amêijoas à Bulhão Pato with a Vinho Verde"
From Jill Barth of L'Occasion: "The Plurality of Portuguese Wine"
From Lori Budd of Dracaena Wine : "Portugal's Political History Effects It's Culinary and Wine Culture"
From David Crowley of Cooking Chat: "Best Portuguese Kale Soup"
From Lauren Walsh of The Swirling Dervish: "Talego - A Taste of Portugal in Paris." From Wendy Klik of A Day on the Farm: "Rustic and Red"
The Oxford Companion to Wine via Jancis Robinson.com. Fabulous recipe! I love that you put a heavier braising liquid on it and served with a red wine. A nice flashback to that rainy day in Portugal. Thanks for sharing it! Wow....what a great looking meal. I want to come to dinner at your house! That is a very impressive dish and to just decide to make it on the spur of the moment like that wow!!! Wow! I love anything with octopus. Can't wait to try your recipe and track down a bottle of that wine. Please let me know how it turns out if you make it! I often find that in my memories of food, the octopus dishes stand out - there is something about them that takes to spice so well and they up the toasting of a grill but remain essentially original. This meal turned out to be beautiful as well, so photogenic! Great shots of the trip too. I love how you describe Portuguese wine as a middling between old and new world styles. I think you nailed it with that statement. Great post, Nicole. Thanks for sharing!